In the blink of an eye, it’ll be Christmastime and will be followed closely by the Chinese Lunar Year in January 2012! Hence, Florist’s Chrysanthemum and the brilliant red Poinsetta (Euphorbia pulcherrima), besides other popular holiday plants, are being displayed on a grand scale at garden centers and stores. 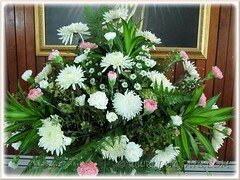 Festive seasons are the best time of the year for them to cash in big-time on lovers of decorative plants and flowers. Nonetheless, because of Chrysanths apparent popularity as garden favourites and cut flowers, one can see them on sale all year round. Blooming non-stop through the growing season, they’ll make perfect specimens to brighten any garden spot. In the United States, Mums (short for chrysanthemums) is known as Queen of the Falls where fall-blooming hybrids signal that Autumn has arrived and flowers are seen in all lovely colours except blue. An ancient domesticated plant, the garden Chrysanthemum has a history that can be traced as far back to the 15th century B.C. in China. Thousands of cultivars have been bred ever since in China, Japan, Europe and the United States, to list a few. However, it is the modern Chrysanthemum hybrids with their showy, colourful and large blooms that come in diverse floral forms and colours that have maintained Chrysanths’ garden popularity and kept the cut flower industry vibrant and thriving. Early this year, we were astounded to come across the extra dwarf and compact chrysanthemum plants in a spectacular profusion of semi-double and double blooms in diverse colours. Simply fantastic! Malaysia’s largest growers and suppliers of Chrysanthemums can be found in Cameron Highlands where the cool and warm climate is conducive for commercial cultivation and production. 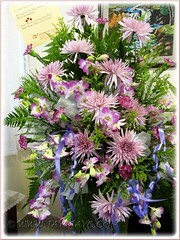 To ensure that the plants and flowers of the Florist’s Chrysanthemum reach their desired sizes to coincide with the festive seasons or specific dates, the artificial light treatment will be applied when long days are required for vegetative growth, and black cloths are used to cover the plants to provide long-night conditions and shorten day-length to induce blooming. Botanical Name: Chrysanthemum hybrids (syn: Dendranthema, Leucanthemum, Pyrethrum). Source: Tropicos.org. Missouri Botanical Garden. Etymology: Chrysanthemum is derived from the Greek words, chrys, meaning golden (referring to the colour of the original flowers in the wild) and anthemon, meaning flower. This name was assigned by Carl Linnaeus, a renowned Swedish botanist who was also known as ‘Father of modern taxonomy’, in 1753. Origin: Native to China where it was first cultivated as a flowering herb in the 15th century B.C. Then, it was brought to Japan in the 8th century A.D., Europe (Holland and France) in the 17th century, and subsequently to England and the United States, and is being widely cultivated elsewhere too. Plant type: An ornamental herbaceous flowering plant. Features: Chrysanthemum is a genus of about 30 species of herbaceous perennial flowering plants which is native to Asia and northeastern Europe. It is related to dahlias, sunflowers, marigolds, zinnias and cosmos, all belonging to the Asteraceae family which is one of the two largest flowering plant families in the world, besides Orchidaceae. The ancient Chrysanthemum species with tall, leafy plants bearing small and yellow daisy-like blooms bear little resemblance to today’s showy flowers that make up the numerous hybrids and thousands of cultivars that have evolved over the centuries. Herbaceous, upright and branching with variable height, some hybrids/cultivars may grow up to 1 m tall, while the dwarf ones are below 30 cm in height. They exhibit differences in growth habit too, with some more compact than the others. They bear medium to dark green foliage with deeply lobed leaves and serrated edges, and have a strong unpleasant scent. Rising above the greenery are the gorgeous and attractive chrysanthemum flowers that come in diverse forms and colours, as a result of extensive hybridization. Floral form may be daisy-like, decorative or pompon, to name a few, and come in an array of dazzling colours of white, yellow, orange, bronze, pink, lavender, purple, red, maroon, and other shades in between except blue. The flower-head of a single daisy type chrysanthemum is composed of numerous individual flowers (florets) with the disk florets in the center and surrounded by the ray florets on the perimeter. Both flower types may be of almost similar or contrasting colours. It is the central disk florets that possess the reproductive system with both male and female reproductive organs, while the ray florets have only the female organs. Irregular incurve, Reflex, Regular incurve, Decorative, Intermediate incurve, Pompon, Single and Semi-double, Anemone, Spoon, Quill, Spider, Brush or Thistle, and Unclassified. Do check out the NCS site for detailed description and illustration of the classification. Simply awesome! No wonder, Mums are hot favourites with gardeners and florists alike. 1. 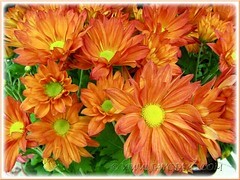 Garden Mums (hardy Mums) – these are perennial chrysanthemums that are usually sold at garden centers in the fall. 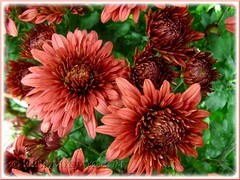 Garden Mums produce underground stolons and capable of surviving the winter in the garden ground with some protection. 2. Florist Mums or Pot Mums or Exhibition Mums (non-hardy Mums) – these are the long-stemmed and houseplant varieties that are sold as potted indoor plants, used in florists shops and exhibited in competitions. These non-hardy plants produce few underground stolons or none, and hence less likely to survive the cold winter. If grown outdoors, they’re usually treated as annuals or short-term bedding plants that are discarded after flowering. 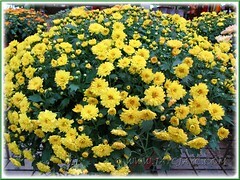 However, in the tropics, Chrysanthemums can be grown outdoors as perennials, in a humid and sunny site. Just pinch and deadhead regularly to encourage emergence of new shoots and maintain a healthy root system by keeping soil moist but never waterlogged and feed regularly. Without a good root system, the plant will die. 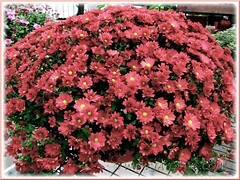 Culture (Care): Chrysanthemums requires a little extra care for optimum growth and flowering. Light: Grows best in full sun or partial sun with at least 5-6 hours of sunshine for healthy plant growth. Soil: Prefers humus-enriched and well-drained, moist soil. 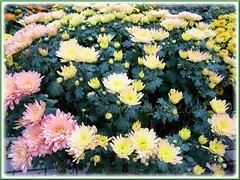 Chrysanths dislike wet feed, so keep soil moist but not water-logged. Others: Chrysanthemums are photoperiodic, needing long days and short nights (summer) for vegetative growth, while require short days and long nights to induce flowering. Hence, never plant them where there is the presence of a street or other light source at night which will delay the bloom date. Being shallow-rooted, they require moist soil and regular fertilizing. Cut back regularly to promote bushiness, resulting in more flowers. This can be done by pinching off the growing tips of each new shoot to produce a compact and multi-branched plant or cut back the flowered shoots to stimulate new shoot production. Mums are heavy feeders, so fertilize fortnightly. Provide good air circulation by not planting them too close to one another to reduce the incidence of disease. Generally no serious pests or diseases. However, leafminer often causes unsightly markings on the foliage and must be eradicated accordingly. Aphids and spider mites may infest too. For subtropical and temperate regions: Hardiness: USDA Zone 3-9 but may vary, depending on the cultivar. Many cultivars need to be properly mulched to protect from the cold temperatures and winds in winter. Best to plant or propagate Chrysanths in spring to enable the plants to become established with a good root system before the fall and ensure survival in winter. Pinch tips of new shoots that has reached 10-15 cm in length, intermittently until mid-summer or when flowering buds appear, to encourage side-shoots and keep plant bushy and compact with more blooms. Moreover, Mums can be perfectly timed to show-off their blooms in fall – find out what to do and when, and read more on cultural care and maintenance at National Chrysanthemum Society, USA and Smithsonian Institution. Propagation: By division of clumps – dig up the established plants, divide them and replant. Alternatively, they can be propagated by cuttings – take a softwood cutting from the top 10 cm of a new stem, dip cut end into rooting hormone (optional) and then stick it into a pot with well-drained potting soil. Keep soil moist (not wet) and locate it at a warm, sunny site. It should form roots in 2 weeks time. Usage: Chrysanthemums make excellent decorative or landscape plants for mass plantings in garden borders and beds due to their mounded habit and extensive range of bloom colours. Ideal too for container gardening, be it indoors or outdoors. Cut flowers have a vase-life of 1-2 weeks and are great for flower arrangements or gifts for various joyful and sad occasions. Dried chrysanthemum flowers have been used in China and other East Asian countries for centuries as a herbal tea or sweetened beverage. According to traditional Chinese medicine, the chrysanthemum tea has many medicinal value, such as a cooling agent to rid of excess body heat, treat sore throat, headache, fever and influenza, as well as disperses wind, soothes the liver, improves vision, lower high blood pressure and helps detoxify and purify the blood. Besides, it has antimicrobial, anti and anti-tumor properties. 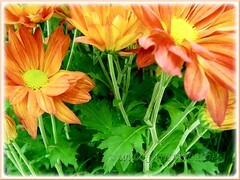 However, be aware that the chrysanthemum herb has been found to have side-effects too, so be cautious. 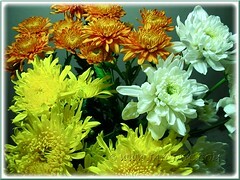 Chrysanthemum plants (C. morifolium or Pot Mum) help reduce indoor air pollution, according the the NASA Clean Air Study. The flowers of Chrysanthemum cinerariifolium are known to contain insecticidal pyrethrum substances that are extracted to provide a natural source of insecticide. More Chrysanthemum pictures to delight you! 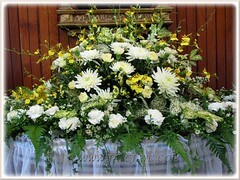 We’d like to dedicate this befitting post in loving memory of our beloved 87-year-old mother (John’s mum, my mum-in-law) who went home to The Lord on Monday, December 12 2011, peacefully. 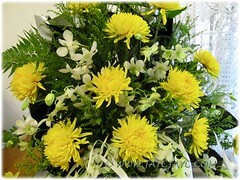 Traditionally in Chinese culture, chrysanthemums are symbolic of death/grief and often used for funerals and on graves. Pondering on our recent bereavement, I find it very strange that I had procrastinated writing about Mums for so long (since early this year) and yet had chosen to draft this post a few days before my beloved MIL’s sudden demise. She was one in a million – the best mother to her two children and their spouses, grandmother to 3 boys and great grandmother to 5. She was truly a blessing to us all and will be forever loved, cherished and remembered. A simple, humble, loving, caring and thoughtful person, with a very generous heart and angelic smile. Never uttered an unkind or harsh word to me during the half century that I knew her. I thank God for having blessed John and I with the gift of caring for her these last 13 months when her daughter was unable to do so due to ill-health. We miss her soooooo…much! and may her soul through the mercy of God, rest in peace. Amen.